Published: July 22, 2016 at 12:34 p.m. Updated: July 22, 2016 at 06:07 p.m.
Huzzah! We're just about a week away from the start of training camp. That means we'll have actual football (or something a lot like it) to talk and write about. But the Fantasy Stock Watch rolls along to kick up dust and stir the pot and raise a little hell and ... well I'm out of clichés. To the Stock Watch! You know that feeling when you think you're about to have a row to yourself on an airplane and then a whole family rolls in at the last minute and drops down next to you? That's probably how Jay Ajayi feels with the Dolphins signing Arian Foster just before the start of training camp. 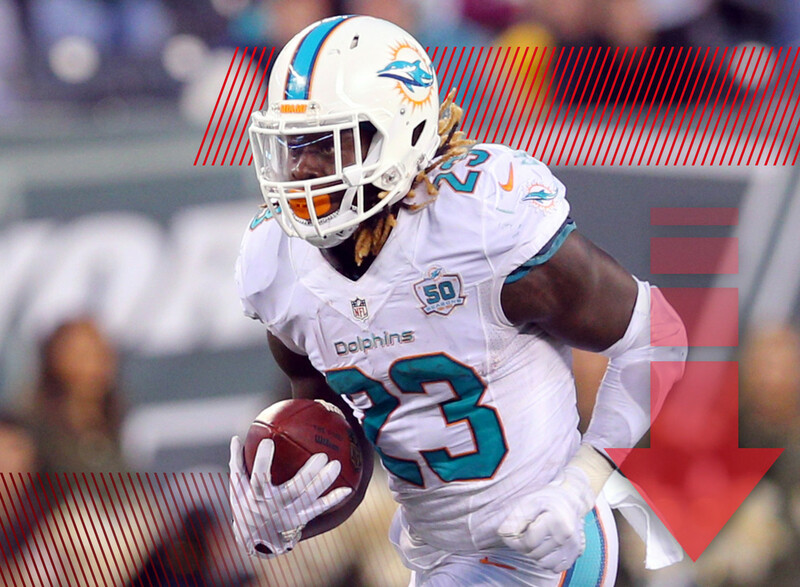 Ajayi is going to still be the team's starter, but his workload this season just got a little lighter. The reports from New York are that Forte could get "plenty of rest" during the season. That's good news for Matt Forte's longterm health. But if it's true, it means we're staring another running back committee in the face. Considering the ever-thinning herd of top-tier fantasy running backs available, this news is about as welcome as a root canal. It's been a few weeks since we've had a Best Shape of His Life Story, but it seems that Winston has dropped somewhere in the neighborhood of 20 points. So we can add the Bucs quarterback to a list that includes Eddie Lacy, Todd Gurley, C.J. Anderson and more. Sometimes these stories mean something. A lot of times they don't. But hey, it's at least something for us to hold on to for the next week or so. We've reached the "promising Titans receiver just can't seem to put it all together" phase of the offseason. All summer long there have been reports out of Nashville that Tajae Sharpe was moving up the depth chart, though the punchline was always that those stories were floated to motivate Green-Beckham. Yet somehow, the wideout has failed to get himself into shape before training camp. Pro tip: if you're blowing smoke to light a fire under a player, maybe don't let the player know it. Kthxbye. Look, I like Duke Johnson just as much as the next guy but has there been anyone whose legend has grown quite so much in a short period of time? The latest story suggest that Johnson could catch about 70 passes this year. In the confines of a Hue Jackson offense, it's not a completely ridiculous idea. But once you've added it to the litany of other Duke Johnson hype train pieces, well ... let's just give the man his gold jacket already. Remind me to ask Hue Jackson for a letter of recommendation the next time I hve to look for a job. He's the world's greatest hype man. It was a lot of fun to watch the Allen brothers blossom last season. But what's in store for the encore? It could involve Hurns moving inside to become the Jags' primary slot receiver. Considering he posted nearly half of his receiving yards and seven of his 10 touchdowns from the slot, this could be a net positive. And maybe it helps breathe some life into Marqise Lee. OK, now I've gone too far. I apologize. It was always expected to be an uphill battle for Doctson to make a big impact on a team that has a lot of pass-catching depth. Right now that hill takes the form of Jamison Crowder, who appears to have an inside track to a starting gig in Washington's offense. This doesn't close the door on Doctson being a productive fantasy wideout, but anyone drafting him is probably better off taking a long view on his potential. The rookie's value is currently greater in dynasty leagues than standard ones. It's taken a little bit of time, but the Melvin Gordon bandwagon is starting to fill up. News that Gordon is working with Adrian Peterson to try and curb the fumbling problem that plagued him last year is only going to hasten that stampede. Solving that issue was part of the prescription I had for Gordon's development in Bust-a-Move. There is hope for 2016! Just when you thought it might be safe to put some stock in Ryan Mathews, it turns out that he might not be a great fit for Doug Pederson's offense in Philly. Sigh. This is why we can't have nice things. Mathews gets a shot to once again be a primary rusher and he gets stuck with a coach who won't emphasize his skills. Maybe this will be good for Darren Sproles, but he won't be enough to win you a title. White is one of the biggest sources of speculation in the fantasy world right now. But his arrow is pointing up after he was described as being a "beast" during the team's mini-camp. Of course, everything about White is at best an educated guess since he never played a single snap last season. Still, he'll be worth a mid-round draft pick based on his potential alone. Sadly we've been down this road before. For the second straight season, Bell is looking at a four-game suspension -- this time for violating the league's substance abuse policy. Now a thinning running back position is getting a whole lot thinner with a certified first round pick looking at missing five of 13 regular season fantasy weeks. DeAngelo Williams, come on down!